What were her motivations for using mobile technologies in her school? What type of support did she get from her school? Could these be relevant to your context? She received support from teachers and colleagues in a variety of subjects and classes. Missing was input from both parents and administration (i.e. head teacher etc.) In my context, these elements are critical for the continuation of technology initiatives through funding as well as support at board meetings and in homes of prominent individuals in a learning community. How did she convince the teachers in her school to use mobile technologies in their own classrooms? What was her biggest challenge in getting the teachers to use the mobile technologies? Would her solution work in your context? 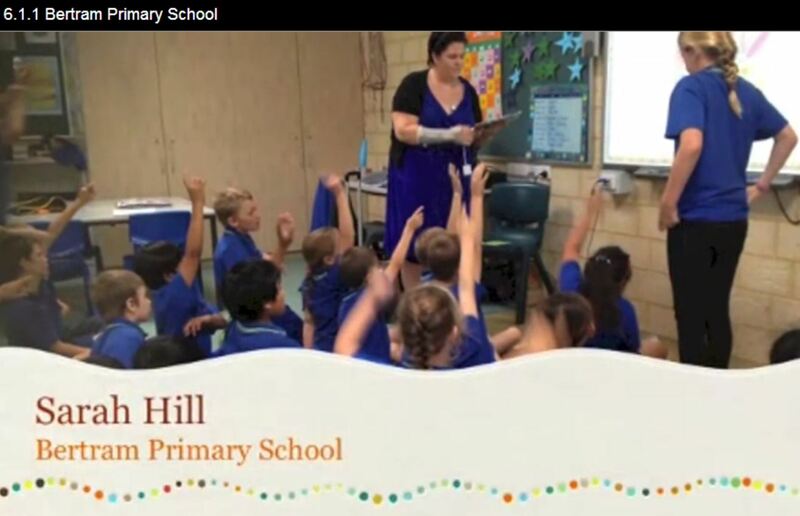 She started by integrating this new tablet technology into her teaching practice with students. This is a good first step as she can shared her direct teaching experiences with colleagues and perhaps even team teaching using the technology. Her Professional Development sessions over a 3 week period were an excellent strategy to boost teacher confidence and skills and give them enough leeway at the beginning to catch up to the “tech savvy” of their students. This approach would work well in my context with time being the ever present challenge in the daily lives of our teachers. I would also create and share a self paced web-based element so that teachers can work at their own pace. (i.e. teachers who work quickly can work ahead and those who need extra consolidation can reference the materials when needed. How were the teachers supported in using the mobile technologies in their classrooms? Were there any evidences from the video that when a teacher had been supported, he/she was more likely to use mobile technologies to engage students in their learning? The video demonstrated evidence of consistent and “just in time” support from the ICT teacher for subject teachers in a variety of grades and subjects (Language, Mathematics etc.) This supportive approach combined with the initial PD session and no doubt the enthusiasm of the students will make this initiative a success in the classroom. This initial break though should be supported by a strategic plan for its use over a longer period. How would you describe this innovation from your point of view? I would describe this project as an exciting opportunity for students to engage in a scientific authentic learning experience involving scientists and other professionals. 2. What kind of challenges do you think this team of educators have faced while implementing and developing that project? 3. What are the elements of this project that you find inspiring and that you might use to overcome some of your own challenges? I like how the research involved professionals as this would be very motivating for students. I also like the scientific background as it creates a clear and transparent framework for learning that students would appreciate. How much technology we need: do we intend to reach One-to-One provision? Do we plan to extend educational robotics equipment? Do we make use of any programmable digital toys? What kind of digital content do we use or plan to? How should it be delivered to our students? This week proved so useful with a number of documents on specific policies, practices of ICT around the world, the arguments for 1:1 programmes, the use of eportfolios to showcase student learning, the role of an LMS in schools and finally, exploring the increasing role and importance of computational thinking in primary education. From this week, the my technology decision task was particularly relevant as a learning exercise and also encouraged me to develop a scope and sequence for computational thinking and programming for primary students. (i.e. more Beebots, Lego We-Do and educational robotics please) Overall, a very useful week with materials that I can use today and in the future. Contributed to the forum on the importance of programming and computational thinking for primary students. 4.1.1 – How should we plan for integrating ICT? Q1. Who should be involved in choosing technology or digital content for a school? Before making choices for Technology, I think that clear learning goals and criteria should be discussed and determined. A combination of administrators, teachers, industry professionals, academic researchers and other important members of a learning community should be involved in this process. Observing students and their use of technology is critical too. Their familiarity and comfortable level with particular devices can be leveraged to encourage a “connected learning” model where their learning at home and school are equally valid. Q2. What criteria do you think should be the most important to be considered when choosing new technology or new content? Ultimately, good pedagogy needs to be considered first and then finding the most effective and appropriate use of technology should come next. When determining the technology, one might consider the who would benefit, the age of the students, the cost of the technology, training and amount of technical support available. Implementation should be planned in clear stages with evaluation and reflection embedded throughout. This same routine will also aid the implementation of new content. Q3. What are your plans for further extending the digital environment of your school, or your schools? What should a school be aiming at? At my school, we have a 1:1 environment with students from Grade 6 and up. In this setting, we need to evaluate the best use of technology to fulfill our learning goals whether computer, tablet, mobile or other devices. Training and support for students, teachers and the wider learning community is critical for students to overcome any barriers and use the technology learn effectively, collaborate with others and solve real world challenges. Determining the appropriate environment (classroom, online, collaborative, individual, video, text, social media etc.) is also an interesting and exciting challenge for the road ahead. Finally, encouraging and maintaining positive citizenship of students in digital spheres or environments is becoming increasingly critical. For this activity, we explored this quiz on Learning Styles and multiple intelligencesfrom Edutopia. 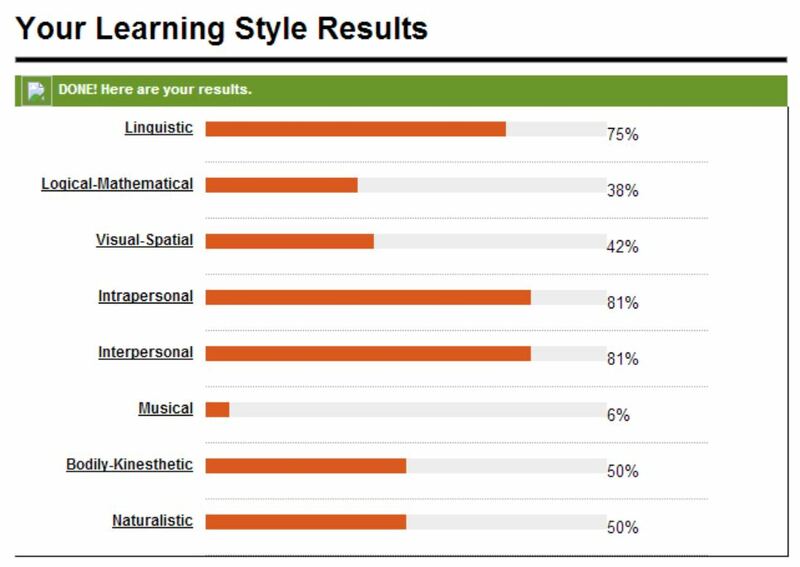 This would be a great to use at the beginning of the year with my Grade 12 students to quickly learn their learning styles and differentiate accordingly. Click below to see my reflection on the course padlet. I think that a combination of F2F training/meetings/ support/ (sometimes just a pat on the shoulder helps! 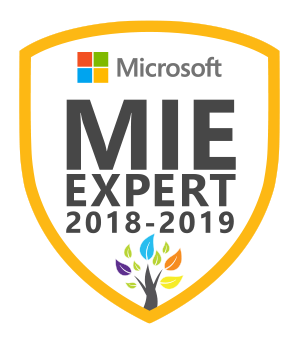 ), access to self-paced courses and perhaps leveraging of social media like Twitter are 3 excellent strategies for allowing teachers the opportunity to learn and feel comfortable integrating new technologies in the classroom. Also support in all parts of integrated projects (Before, During and After) combined with a determined and independent approach by teachers to innovate and implement successful new pedagogies involving technology. Student learning must be a forefront of new initiatives. 1.3.1 Paste one example from from 9 different countries. What ideas and methods are relevant to our school plans or future policy? 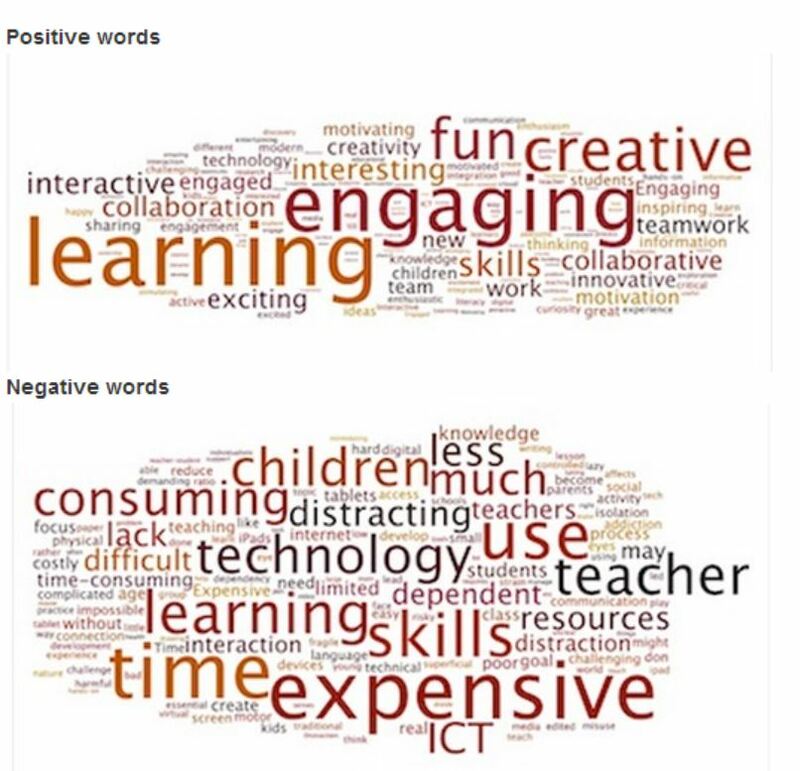 1.2.4 What are your main reasons for thinking ICT should or should not be used in primary education? I argued that ICT when accompanied by good pedagogy can be an amazing tool for learning as students have opportunities never before available to them. It can be a platform for creativity, collaboration and critical thinking through well chosen software and web tools. Finally, I believe we have a moral obligation to embed technology for students in order to prepare them for the world now and in the future. 1.2.2 Which aspects of technology use foster which types of learning? Acquisition Students might access learning materials (videos, animations, slide decks, even text, as a whole class, in groups or individually using links on our Learning Management System. I like using the “Flipped teaching” for the transmission of content for so that students can access material beforehand. However, it is important to give students access during classes for those working sequentially and after classroom activities for consolidation. Having these material easily available (class, home, online etc. encourages their use in anytime or anywhere model of learning. Discussion Students might contribute to a recorded oral discussion, an online forum or discussion board or even add their comment to a web page as assigned. Investigation Having learning materials available online (i.e. Google Apps, YouTube etc.) allows learners to opportunity to monitor their metacognition, especially if extended through a game, quiz or self-assessment tool. The ability to pause, rewind, fast forward helps students manage their own learning acquisition. However, a variety of online researching with multiple paths for discovery. (i.e. When researching about Ancient Greek pots, students were able to navigate the site on their own. Practice This type of learning might be explored through WBLT’s (web based learning tools), simulations or educational games. A site like Scratch might also be a place to create and curate digital programmes. Collaboration In my teaching, Google Docs and applications have been excellent tools for collaboration this year with students. Assigning roles, limiting collaborators (less than 4) giving criteria for editing and explaining different sharing settings (view, comment and edit) are ingredients for success. Other collaboration tools would be Voice Thread, Popplet and Bitstrips for Schools…. Production This would be a good place to describe multimedia projects like videos, photo slideshows, animations, stop motion animations etc. along with the apps listed above. 1.2.1 Why should we consider using ICT in primary schools? Contributed my positive contributions about children learning and creating with tablets. Added “student-centered”, “fun” as positive words and “distracting” as a negative word to the Google Form. An excellent use of a Google Form BTW! Here is a screenshot of the Word Cloud created by the course. Completed Section 1.2.1 and watched YouTube clip on Kindergarten students creating a video on Butterflies. In my opinion, I think this is a bit too young for this type of activity.Perhaps that the students should have 100% attention on the activity (i.e enjoying and observing nature) rather than distracted by the screen for picture taking. (what if they missing something cool because they are looking at the screen.) Perhaps the teacher might take some photos when the student notices something. That amazing moment could be displayed as a resource as the students draw, discuss, create… in the class. However, this is an amazing activity for Grade 2 or 3. Decided to add a new section to new blog in WordPress called academics to put my “Learning Log” from my graduate courses and my “Course Journal” from this MOOC. Others might benefit from this but mostly should be a place to work out ideas and thoughts in a written form. 1.1.1 – May 28th -Watched Week 1 video and contributed to the introduction forum. Amazing how on this MOOC there are so different educators from different countries connecting through so many different devices too. Created my Course Journal – This page will be used as a notebook and reflection of my professional learning in the ICT and Primary MOOC. I set this page in my blog as a place to record resources and reflections as suggested in Week 1 of the course.